Japanese and Western strings that resonate . East meets west! And violinist Sarah KOMATSUBARA Mikoromoand ( Sharari ) , it is a collaboration unit by Tsugaru shamisen player Pierre Ono . A novel combination of the Tsugaru shamisen , a traditional Japanese instruments , stringed instrument called violin to represent classical music , and has produced music that is acceptable to people of all ages and nationality . Currently, appeared in Party Concert Live especially in the metropolitan area , has gained popularity slightly Japanese and foreign questions . Also I am developing a music various activities such as planning and the concert . Get the Tokyo official Heaven Artist topped the challenge in 2013 , and 50 times magnification , and is one of the most unit must keep an eye on now . Kamakura City Board of Education sponsored concert " collaboration - beautiful classic sum fun Kazuhiro "
Participation in 2002 pro street body Tsugaru shamisen performance unit in the " security Shami Street " , to activities , such as street festivals , TV sets, radios at home and abroad . To fit the excellent results , such as runner- up in the Tsugaru shamisen Competition Standing " Warehito ( Hollande ) " Tsugaru shamisen quartet . Join " ASH-Roty ( now " thunder THE sun ") to which was formed by young Japanese music player than our '06 , active in the show , such as in Ginza Hakuhinkan theater and Shinagawa Prince Hotel Club eX. 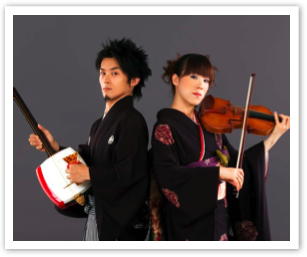 ( As a " project KazuTsuyoshi ") , has developed a wide range of activities to provide music performers , such as shamisen guidance to actors responsible Katori Shingo starring the " Zatoichi TheLast " music . Musashino Academia Musicae graduation . Started working as a violinist than student . After graduation, he formed string quartet "La SUR String Quartet " , the Spanish band " Arco Guitarra " , Latin band " Chachara - Noche ", etc. , to expand the playing field throughout the country . Many other performers , concert board domestic and overseas cruise " Asuka " in the " Pashifikku-biinasu " is also a good reputation in special events at the Tokyo Disney Resort as a soloist .